What could possibly make a life size 5ft (60in) teddy bear even better? Personalize him! This is a great gift idea for Valentine’s Day, birthdays or anytime you want to send a unique present to someone special. 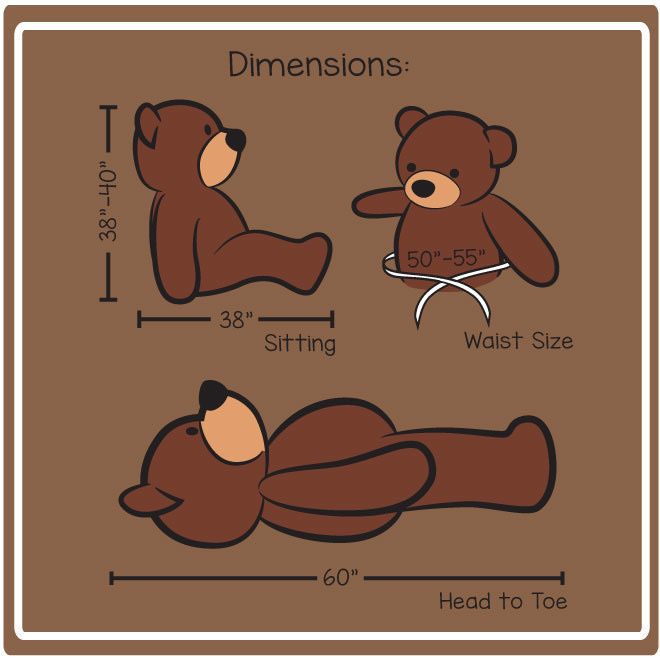 Our teddy bears are so cuddly, with big huggable bodies, warm brown eyes, and soft black noses. Choose your favorite super soft and snuggly fur color, and we’ll add a shirt with a personal 3-5 word message from you. Choose your favorite color! Please use the pull down menu to make your color selection before adding it to the cart. The shirt is specially designed for our 5ft (60in) teddy bears, is washable and removable, and is white featuring a big golden paw print design. We’ll print a special message from you (up to 5 words) on the front under the paw print. *Enter your message in the ‘Shirt Message’ box – please check spelling carefully as we will print it exactly as you type it. This bear was given to me by my fiance and I love it! !